We are very close to Tottenham Court Road Tube station – exit the station on to Oxford Street and turn left. Rathbone Place is a few streets along on the right hand side. Situated just off Oxford Street, our London Shop is easily reached from Tottenham Court Road tube station, and is only a little further from Oxford Circus. 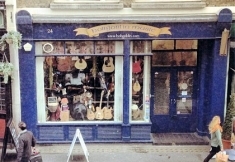 This busy shop has Londons best choice of Folk Instruments, and a big range of Guitars, World Percussion and Recorders, as well as a repair workshop with well known and very experienced repairman Michael Cameron in residence. Our London staff have many years of experience with us and are very knowledgeable. There are car parks nearby, also meters, and lots of other stuff to see and do! We do repairs! We carry out some instrument repair work on site, and can also send instruments to specialist repairers for more complicated work. Repair work undertaken includes ukulele, bouzouki, mandolin and guitar setups and restringing, accordion, melodeon and concertina tuning and repairs, woodwind and brass repairs and maintenance, specialist violin set ups and repairs, bridge and peg fitting, bow rehairs, banjo or drum skin replacement, and much more besides – contact us for information or bring in your instrument for a free, no-obligation quote. If you’re looking to sell a musical instrument then get in touch to see what we can offer you. 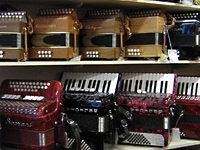 We buy some instruments outright if the price is right, and we’ll consider a trade-in for almost any instrument. We also take lots of instruments on a commission basis, and we’re particularly keen to stock instruments by local luthiers and makers. Bring in your unwanted guitars, ukuleles, banjos, concertinas, melodeons, accordions, flutes, woodwind and brass instruments, violins, keyboards and more, and we’ll see what we can do for you! 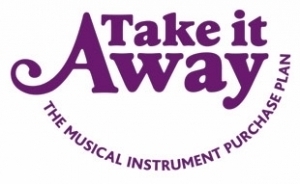 If your instrument is bulky or you would need to travel a fair way to get to us, please do contact us by email or phone first so we can let you know whether it’s worth bringing in. 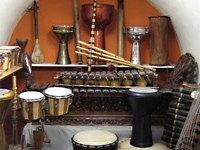 We are often able to offer short or long term musical instrument rentals for various types of instrument. If you would like to rent a musical instrument from us, please get in touch to find out how we can help. As part of the Arts Council’s Take it Away scheme, Hobgoblin is able to offer interest free credit to 18 – 25 year olds! Paul was so helpful, he has given life back to my violin that has been out of action for nearly 10 years! I had a great experience in the shop and was given encouragement and advice about picking up the fiddle again. I’ve been thoroughly enjoying playing again so far. Thanks SO much. I will pop in again! The staff was so friendly, helpful and welcoming it started off my whole London sojourn on an excellent note. The service and advice that I received was first class and I would certainly recommend buying from your company. I really appreciated the help and also the friendliness of all the staff in the store. Based on today’s experience, I would definitely come back for future musical needs 🙂 Thank you! Sonny played a Hohner accordion beautifully to show us what it could do. Brilliant service in a wonderful place. I was thrilled with the service I received. I called several hours after closing time, in sheer desperation and still received courteous and efficient service. Thanks so much, Joe, for helping me find what seemed to be the last guitar (of the type I needed) in the UK! The service at the London branch was excellent… Top staff you have there. Was served by who I believe must have been Paul Gardener, and I was warmly welcomed to my ukulele browsing. He was extremely informative and opened my eyes to a new range of ukes. Please send him my regards (he may remember me as a girl from Portsmouth who works at the range) and tell him I bought a Clearwater electric uke in the end! Top class products, superb service and repairs. Really nice staff; very friendly, and their product-knowledge is second-to-none. First class service, from your London store. I’m a ukulele artiste (professional), and I love talking to the chap behind the counter, who owns a really top-class ukulele-banjo, which he won’t part with at any price. 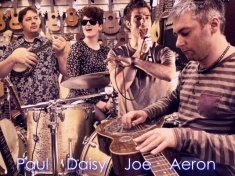 I regret not having asked for the name of the guy that helped me choose my new Ashbury ukelele today as I\’d like to have ensured that this feedback goes straight to him – he was a genuinely nice chap and very helpful indeed. Great vibe in the shop, too. 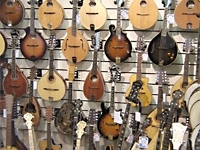 I went into the London shop yesterday to buy a mandolin. Paul and then John took time and effort to understand what I needed – no easy job as I ‘ve taught classical guitar for 40 years! I bought a Carvalho, which is just wonderful. It and the guys need a big word of thanks. All said, a great experience! I don’t think I have ever known a shop to go out of its way to be more helpful. Despite problems with the melodeons supplied, staff did all they could to ensure that I left a happy and contented customer. Which I did. Who could ask for more? Excellent service and very helpful. Absolutely no complaints at all…I bought a Cigano GJ-5 from you…and just wanted to say that I’m very pleased with it…Many thanks for the excellent service…I had intended to buy online, but I’m so pleased now that I didn’t, and came to you guys instead. Traveled 90 miles and was not disappointed, very knowledgable and friendly people. And very happy with my purchase, thank you. Just thought i would drop you both a quick e mail about a member of your staff in the London store John Howlett. 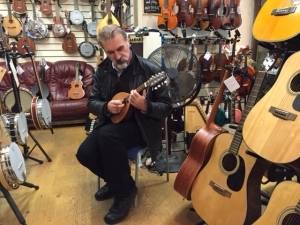 I recently went in to grab a couple of bits of percussion and started talking to john about banjo lesson- i had previously received a banjo from your shop a year or so ago as a present- John then as the shop was closing offered me an impromptu 15 min banjo lesson after the shop had shut. In those 15 minutes with Johns kind advice encouragement and enthusiasm i feel as though i learnt more than having two, one hour one to one lessons from other banjo teachers. It also allowed me to go home and pick up the banjo again and actually play a couple of little riffs rather than the dull open string runs which the books all seem to teach you. by text: Hi Pete I just bought a guitar for my daughter from your Rathbone Place shop. Aeron served us and was excellent! May I compliment the guys there. Helpful, understanding, knowledgeable and patient. [My friend] and I were busking away in the shop for about three hours and having a great time…. However the main reason for writing is to thank the guys in the shop for the advice and help in buying a new mandolin for myself. It has turned out to be just perfect for my needs..sounds great, action superb and plain looking but expertly finished…just the way I like it. Everyone has complimented me on my choice and those who know about these things say I have made a great choice..well that was down to your chaps in the shop… many many thanks for everything. I was looking for a 12 string guitar. I saw one at half price and phoned your London shop where they had it. The man I spoke to told me it was not satisfactory and not to proceed with the order. I do not know if the management will be happy but as a customer I think that was great! You cannot beat a supplier you can trust, thanks to the bloke in your London shop. I have ordered another 12 string. Staff in London very helpful rang a couple of times and put aside some items, nothing is too much trouble for them. To all the staff at Hobgoblin…London, I would just like to thank you for the excellent service I received when trying out Banjos in your shop, nothing was too much trouble, in this day and age with its take it or leave it attitude, I found none of this at Hobgoblin and the Deering Banjo I bought has a superb tone, once again thank you for your help. I would just like to say that one of your staff was amazingly helpful and just incredibly nice (whether I did nor didn’t buy anything)…there was no pressure on that end, which I really admire, and incredibly knowledgable – he wasn’t just out to make a sale. [Paul] was extremely attentive and informative when I visited your shop in search of a bansuri. You are exceedingly lucky in having him as an employee. My previous experiences with music shops were unpleasant. 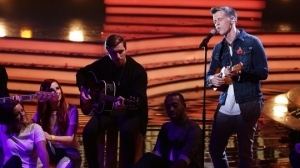 Ashbury ukes really do have the X-Factor!